The crew at Avenal Sand Drags in Avenal, CA has been working diligently over the past few weeks wrapping up the track surface improvement project for the upcoming event on April 26-27. Avenal Sand Drags would like to thank Ron D’Artenay, Marc & Ralph Whitmore, Ron Moran, Ross Racing, and Tom Ince as well as all of the folks who trucked in loads of sand and loaned equipment. This project could not have taken place without the support of all who helped. Click “Read More” to view photos of the smooth surface. The Pro Truck Nationals (PTN) Season Opener is just around the corner at the PTN Heartland Nationals at Atoka Motorsports Park in Atoka, OK on May 23-25. Read on to view the latest updates on the 2014 PTN race schedule as there was a change due to the recent closing of Big River Sand Drags in Bonne Terre, MO. 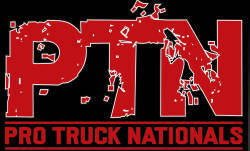 The 2014 Pro Truck Nationals (PTN) series is excited to hit the track for a new season of racing. Unfortunately, there have been some changes to the PTN schedule & series for the 2014 race season. Everyone was looking forward to Race 2 at Big River Sand Drags in Bonne Terre, MO. 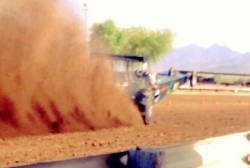 PTN was recently informed by track ownership that the facility has been sold and will no longer be a sand drag track. Big River Sand Drags has a rich history of PTN action and we are saddened by this news, but we wish the best to the Merseal Family in their future endeavors and thank them for their service to the sport. 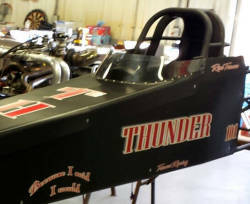 The Oklahoma-based Trower Racing team continues to ready their new four-cylinder Dragsters for competition in 2014. Rod Trower sent us a few updated photos of their progress. This team is gearing up for the 16th Annual Heartland Nationals Presented by PTN & PSDA at Atoka Motorsports Park in Atoka, OK. Click "Read More" to view the photos. Dome Valley Testing Update: We received a note from Marcus Norris on their testing at Dome Valley Saturday. The Pat Norris Racing Team Top Fueler was on a great pass before it powered into a huge wheelstand around half track, and it unfortunately slammed down hard causing damage to the front half of the chassis. Thankfully Marcus was okay after the wild ride. The team is encouraged with their results, and plans are moving forward to have the chassis repaired for the Fall races. Check out this video of the pass submitted by John Semroska. Lemoore Raceway in Lemoore, CA is gearing up for their Season Opener this Friday night, April 4. They will run a four race point series with the other race dates being May 2, August 8, and October 24. This track runs a mix of heads-up and Index classes. For more information, go to www.lemooreraceway.com. Click “Read More” to view their 2014 event flyer.